I often find myself lying on the ground at the moment. In front of the fire, in the kitchen, on the cold not-yet-spring grass or the hot bathroom floor, body spread all over like something that completely has it’s own life and needs. It sure has and I cannot control it. Does this sound too weird? I’m not sure but I don’t mind honesty I guess. It’s as rare and delicate as an old piece of fine vintage clothing or a thin ceramic cup, made by the hands of a loved one. This body of mine suddenly house so many conflicted feelings and urges. Bursts of energy alongside endless tiredness. Tears together with laughter and not to mention a baby’s growing body together with the one that is already here and thought it was oh so strong and steady. I rise and crumble at the same time, over and over humbled and stunned by this world and this creation, by what we can do to support ourselves, one another and the whole of it all. Not to sound too pretentious but with cracks, we expand, light always enter and by embracing that light we find new ways and new bravery. 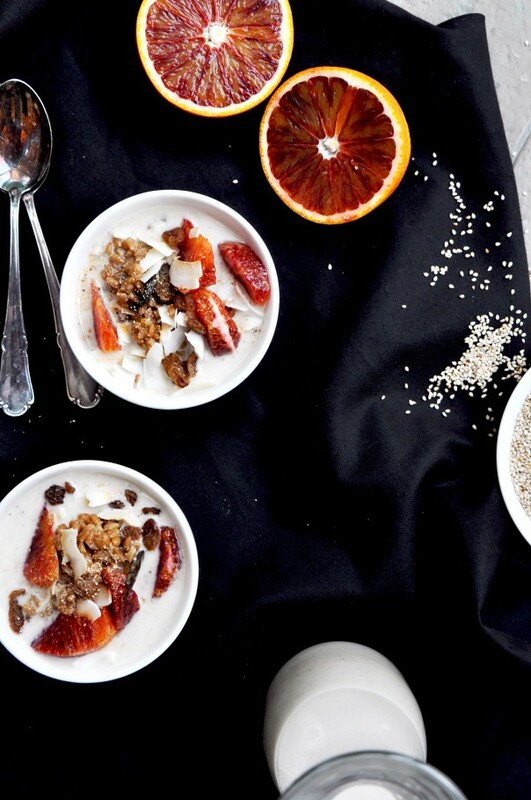 This week, a sensuous and luxurious breakfast porridge is my way. The thing I need is just this. What do you need? Open Sesame! Personally I have been hooked on the alkalizing and powerful sesame milk for a very long time, we met way before I started making nut/oat milk and it was a result of a brief encounter with a woman on a bus telling me about the benefits of sesame milk. 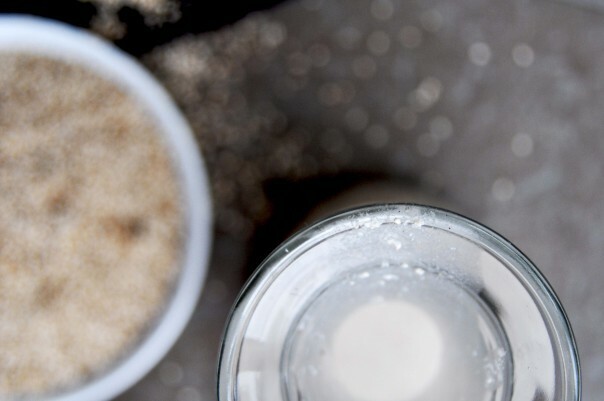 I was still living at home at the time and when I started blending those seeds every morning my dad got curious, turned out he made sesame milk when he was my age too. Sesame as a crop has been around for quite sometime, domesticated for well over 5000 years. Women of ancient Babylon would eat a mixture of sesame and honey for health and beauty while Roman soldiers ate it for strength and energy. I love food with stories but the story I wish to talk to you about today is a bit different though, but definitely equally exciting. Do you know about the ”Got Milk” campaign? A million dollar movement and ads with the purpose of making us drink more milk to get strong, smart, healthy and beautiful. But is this really the best way to get our calcium, b12 and vitamin D? While milk does contain all of these components there are a few other factors we need to consider as well. What about the lives of the beautiful cows? They do not live on a sweet farm anymore and they certainly do not get to much fresh grass all day (unless you go get your milk from a local organic farmer). Instead most ”dairy cows” live incredibly sad lives in horrible environments with food and hormones that is far from natural and I am sorry but we cannot forget about how their lives end. We are a human beings living on this earth today and seriously, we need to do our research. Watch ”Food inc” and ”Food matters”, read ”Eating animals” and make your own non government bought decisions. ..and what about sesame seeds? These little wonders actually contain a higher level of calcium than milk but the awesome part is that the seeds also hold an impressive amount of magnesium which together with vitamin d is essential for calcium absorption. Magnesium also stimulates our calitonin production, calitonin is a hormone that makes calcium stay in the bones thus keeping it from being absorbed into the soft tissues. But why would calcium be absorbed into our soft tissues? Isn’t it´s place in our bones and teeth? Well, if our blood gets too acidic our clever body try balancing this by drawing alkalizing minerals (like calcium) from our bones. Not very surprisingly dairy – especially the products from cows – are very acidic and the countries where dairy consumption is high, so are the numbers of people suffering from osteoporosis. Worth a though. An important thing to remember is to soak the seeds in water and acid (like lemon juice) and thoroughly rinse them before blending your milk. This starts the digestion process of the seed, reducing the amount of oxalic acid that would otherwise interfere with the absorption of calcium. And yes, get some good vitamin D supplements. 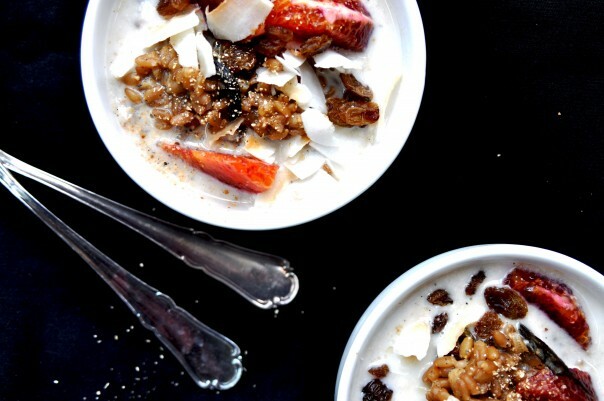 This warming and wholesome porridge will with it’s many luxurious additions completely change the way you think about a plain old bowl of porridge. This one brings ecstasy to my taste buds and leaves me full and nourished for a long time. Tip 1: make a big batch of spelt – it will come in handy in salads, as snack, when baking or making a soup. Tip 2: Upon rising, start cooking the spelt, then you have time for some journalling/yoga/meditation/sunbathing while it cooks. 2. Rinse them well and them add to a saucepan along with the water and vanilla bean, bring to a boil and then let simmer for 45 min, add salt towards the end. 3. Add Maca and spices when ready. 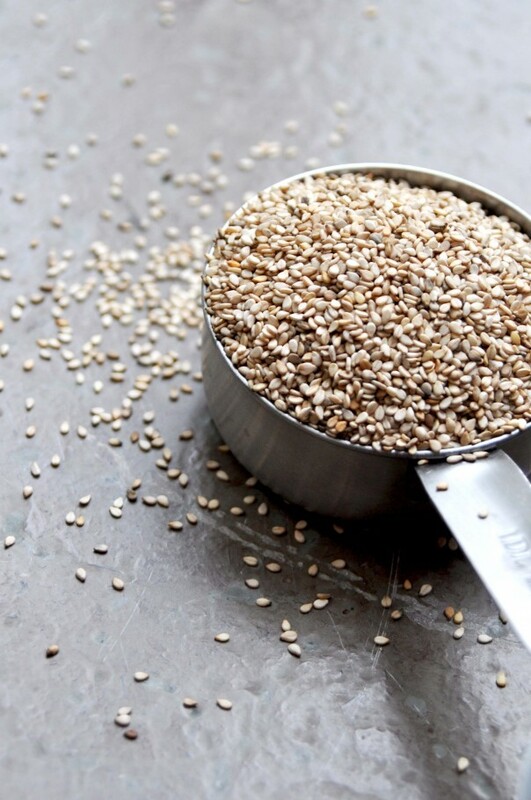 1 cup sesame seeds – always use unhulled! 2. 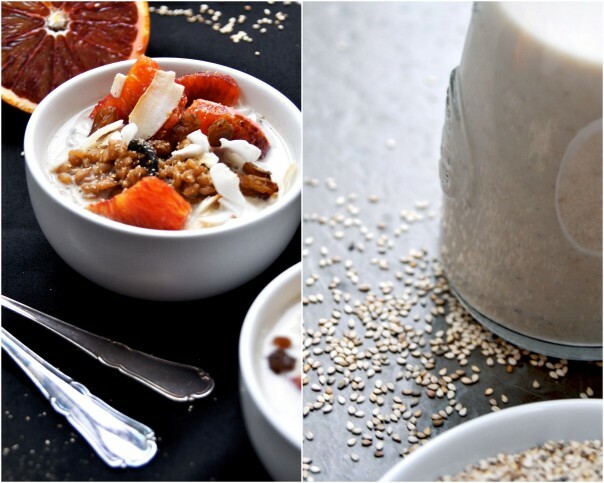 Add sesame seeds, water, dates and cardamom to a high speed blender and blend away. Done! 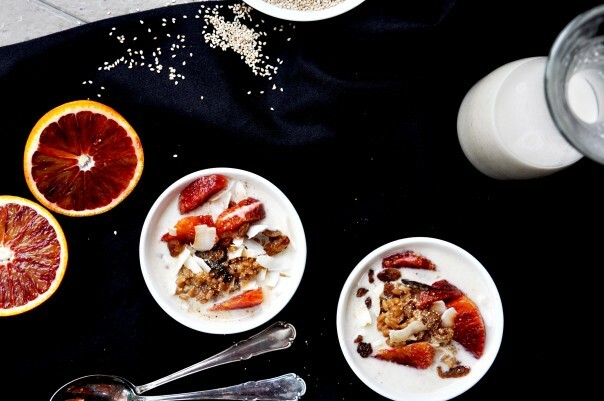 Time for a luxurious and insanely tasty breakfast party! So along with all that ”sesame open” power and floor scattered honesty I´m off for a walk in the sunshine (knowing I might end up on the ground). Remember what I wrote earlier in the post? ”What do you need?” Go ponder! Go do! Go honest!